Okay, now to get this thing into Poser. If you haven’t followed the previous tutorial on grouping the mesh and exporting it from C4D, click here to view it. You’ll need UVMapper in order to do this next step. 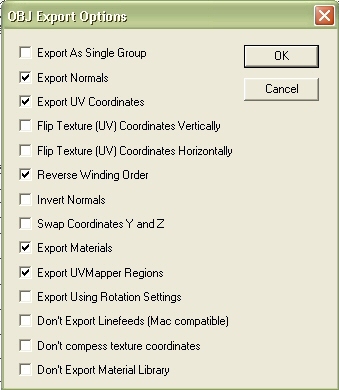 Open the exported model in UVMapper. Go ahead and map the model while you’re here. One thing I like to do is choose to Color by Group. That way, you can see what you did in C4D with the selections and splitting. Okay, so this mesh has a few problems, but we’ll fix that later, well not that we’ll show in the tutorial, but in real life. 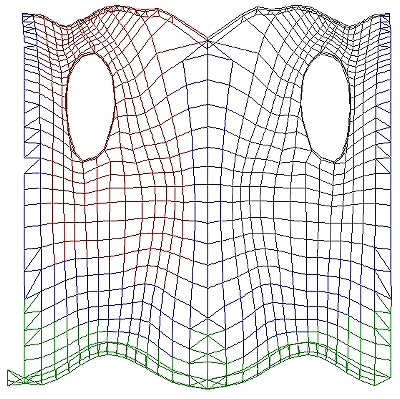 While in UVMapper, set the Material Zones. You can either set the material zones to match the groups or make up your own. For example, you can select the top part of the outfit and name the material zone “Bodice” and name the bottom part “Skirt”, etc. When you are done mapping the object and setting the material zones, choose File : Save Model from the menu. Check Reverse Winding Order then click on OK. This is very important when using meshes that were modeled in C4D. Add a “2” to the name of the object so it doesn’t overwrite the original one. 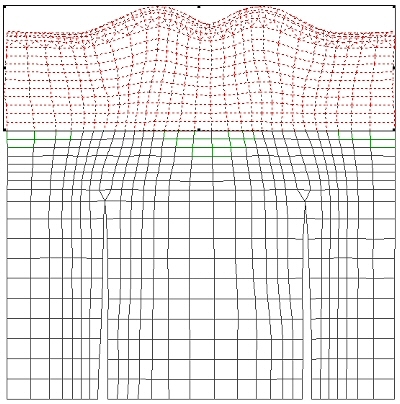 Choose File : Import : Wavefront OBJ from the menu. Locate the obj you exported from UVMapper and open it. 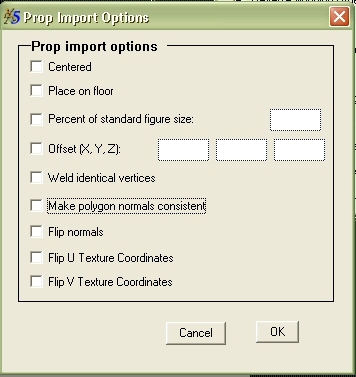 In the Prop Import Options panel, deselect everything. You want the obj to import into Poser in the exact place it was in C4D, so deselecting all the options does this. 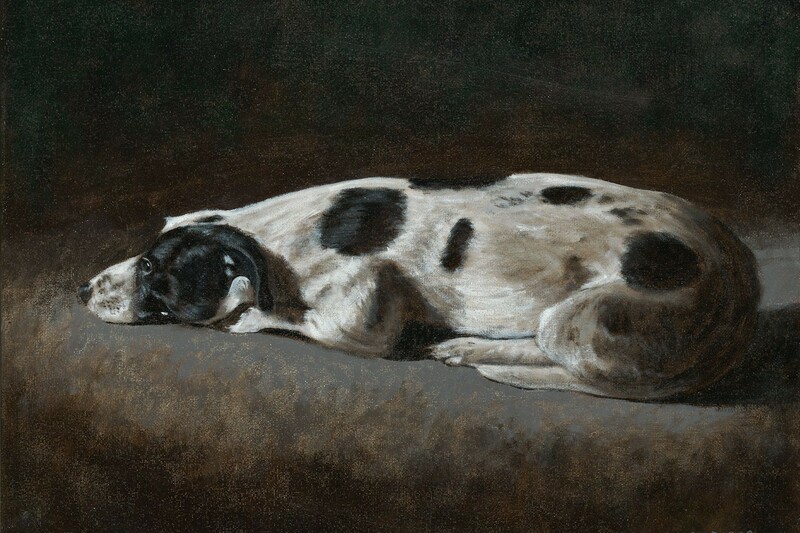 The obj will import into Poser in the exact place you need it. You shouldn’t have to do any moving or scaling if it was modeled to match the figure in C4D. Oh, just to show you, if you didn’t select Reverse Winding Order when you exported the obj from UVMapper, it will import into Poser backwards. Now you need to bone the item. Since bone setups can’t be copyrighted, you can literally use any one from your library, or you can do them manually. Go through your clothing libraries and find an item similar to yours. For this one, I’d use another shirt I have for the same figure. If the shirt were for Victoria 2 or 3, I’d use shirts from DAZ. In order to use the donor setup properly, the groups will need to be the same in both items. Of course, you’ll need Poser Pro Pack or Poser 5 for this. With the item selected, go into the Setup Room, you’ll get the warning shown to the right, just click on OK. While in the Setup Room, open the library and locate the item you want to use as a bone donor, then double-click on that item. Poser won’t load the item but it will load the bone setup and apply it to the new item. 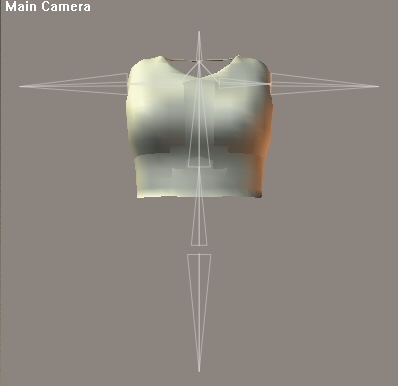 I now know that the bone setup for this shirt matches another clothing item that is made for the same figure. 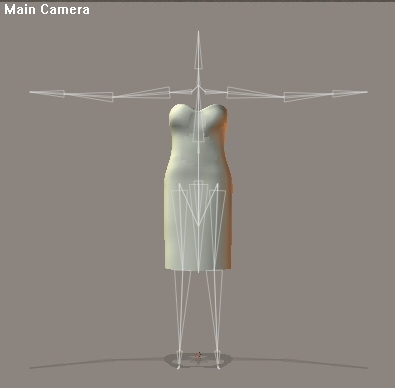 Here’s the bone setup for the dress I showed you earlier. The setup was taken from an oufit that had the bodyhandle setup being used since the dress also uses that setup. Now, go back into the Pose Room and you’ll notice that your item is now a figure. 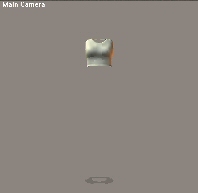 Load the figure that the clothing item is for and conform the clothing to the figure. Rotate the figure and look for any pokethrough. If you find any, open the Joint Editor and adjust the numbers there until the pokethrough disappears. Usually the ones under Orientation are where the problem is. Once you are happy with the clothing item, save it to your character library and you are done.